The Floating Empire: Some Notes at the End of Winter. . . .
. . . or at least we HOPE we've seen the last of the really cold weather. I thought, with what appears to be the last of the really cold weather behind us, that I'd do a bit of a recap on our experiences in our first winter on Floating Empire, and what we've learned. 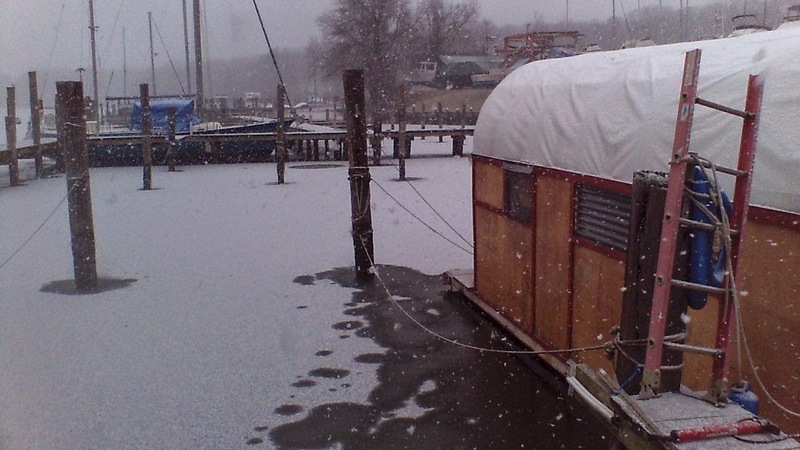 I say this knowing that some of you liveaboards out there deal with far colder weather than we experience here on the Chesapeake and would love to hear your experiences as well. First of all, we were rather fortunate at the beginning of the season. Temperatures and winds were mild, and we had just added a bit of insulation to the boat. We found that running our big Kirkman lanterns was enough to raise the internal temperature 15-20 degrees (Fahrenheit), and that snuggling up top in our comforter was just fine in the nights. But when January hit and the temperatures began to drop, it became apparent that we weren't going to be able to keep the temperature at a comfortable level inside the boat. Outside cold was one thing, but strong north winds stripped heat from the structure at a sometimes alarming rate. Since we had connected to shore power for our refrigeration, we purchased a small electric heater just to take the edge off when we were working, running it a few hours during the day at first, then overnights as the temperatures dropped into the 20s. It became apparent that that wasn't going to be enough, and that the expense of running the heater was taking us in the wrong direction vis a vis being off grid. 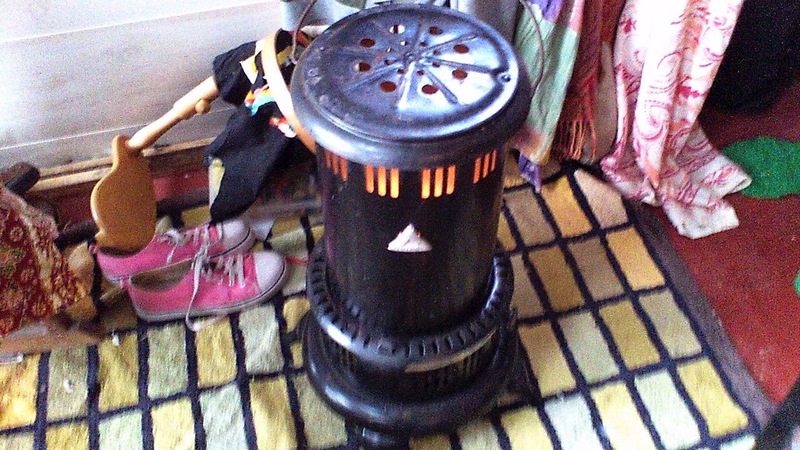 Well, better than nothing. . . .
One of our slip mates loaned us an antique kerosene heater to try. 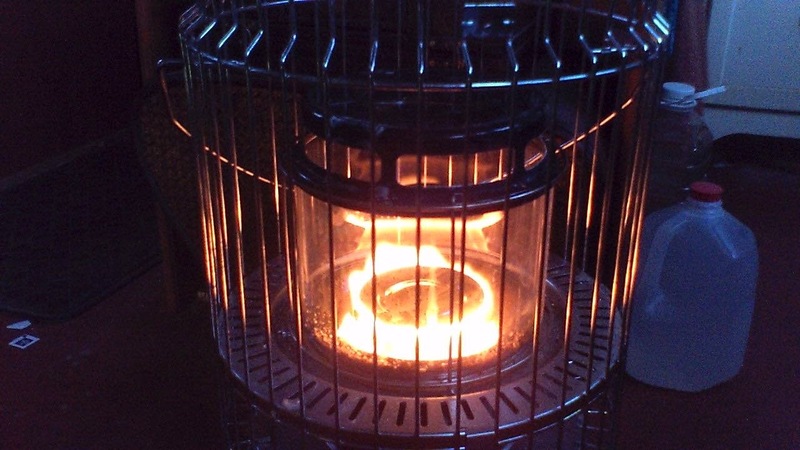 We had been really pleased with our 16 wick Butterfly kerosene cookstove, so we thought we'd give it a try. The results were pretty impressive. 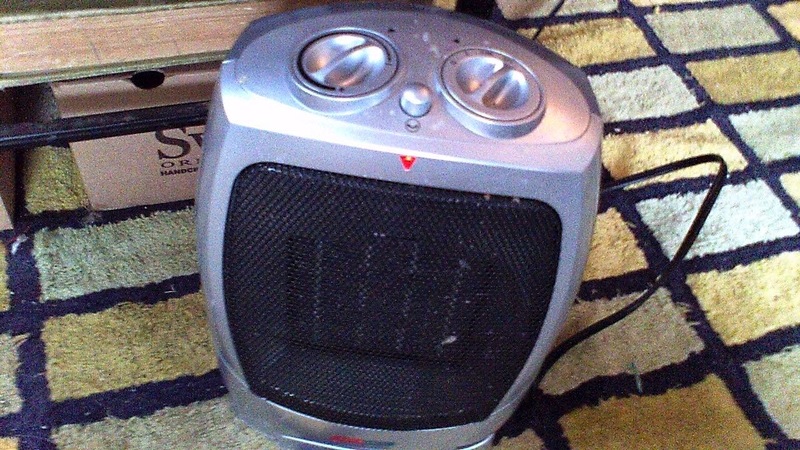 I had very little experience with Kero heat before this and was pleasantly surprised. The heat was clean, low odor, dry, and wonderfully persistent. Based on that experience, we purchased a Dura Heat DH1051, a Korean made 10,500 btu heater, for a little over a hundred bucks new on them interwebs. We were immediately impressed, and things aboard got immediately more pleasant. In fact, we were occasionally getting the loft area too hot. So on all but the coldest days, we run the kerosene heater down on the main deck, usually in the kitchen area (we get quite a bit of insolation aft in the studio, and that can keep it pretty warm with no help during the days). In the evenings in all but days in the single digits, we burn a few of the Kirkman lanterns blowdecks to keep the chill at bay, shut off the Kerosene heater, and run the little electric up in the sleeping loft at it's lowest setting. This has kept things really quite comfortable. As we move into spring, I suspect we'll reverse the process by which we got here, gradually paring down our heat sources until it's just a few lanterns. Here I would be remiss if I didn't mention how valuable having our wonderful friends here at the Marina has been. During the winter we've had temperatures down to -1 Fahrenheit, winds gusting to 50 kts, sheet ice across the Middle River, frozen snow on the docks, frozen pipes in the bathrooms. With every extreme event, we were besieged by calls and texts from our slipmates, wanting to know if we were okay, if we needed a warmer place to stay, if we needed a hot bath, a hot meal, laundry. . . . .We were fine, but those calls and texts do a lot to warm a cold winter. So here are a few notes of the things we had to deal with, things that worked well, and stuff we felt you might like to know: hopefully you'll find them useful. Boats, by their nature, have limited insulation and very little thermal mass. They heat up quickly, they lose temperature quickly, and wind has more to do with that than either air temperature or water temperature. We learned to carefully mind the windspeed and direction in planning for things like outings and projecting fuel usage. We sit low in the water. With the accumulation of snow and ice, you sit lower. We wound up being rather circumspect about clearing snow from the bow, breaking ice off the lines, and doing what we can to remove the ice accumulation from the sides of the boat. Lapping water on our low side rails, with a cold north wind, leaves an accumulation of ice along the sides of the boat. The weight is noticeable. In spring we'll be adding a set of walkways to the sides of Floating Empire which will allow us to more easily deal with things like that. Submerged Ice Eater, keeping the surface ice under control. Floating Empire has no pressurized water system, so freezing really wasn't an issue, though we did manage to get the line plugged with ice on a couple of occasions. 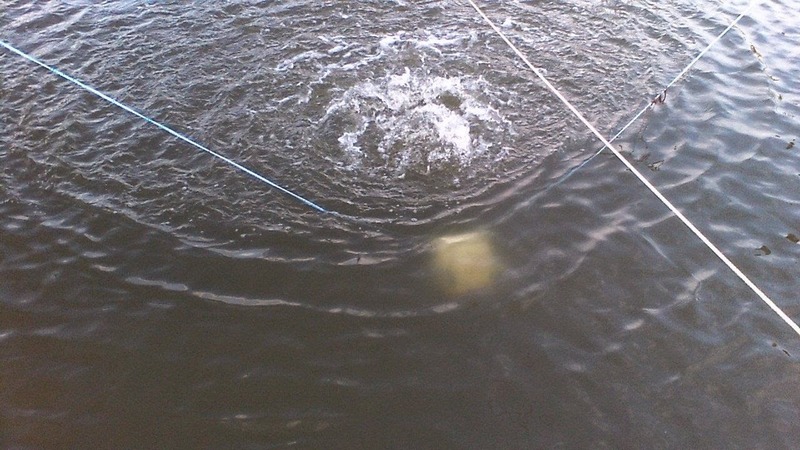 We built the boat so that our water lines into the river could be retracted, so on REALLY cold nights, we would retract the line to our pump and drain it which ended any of our ice problems. 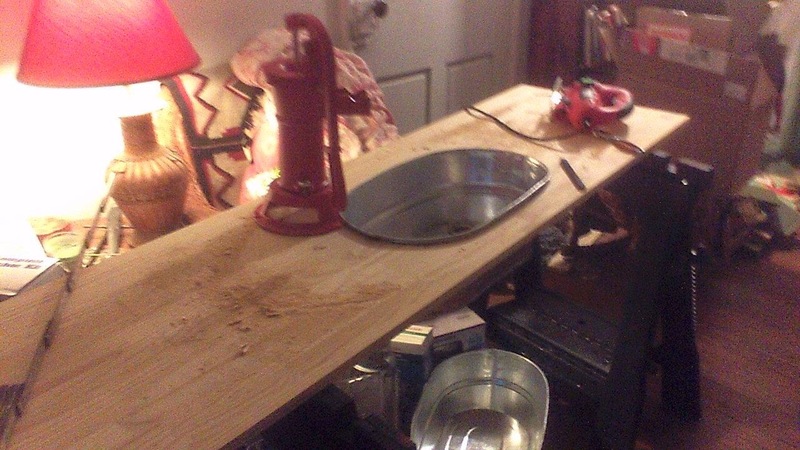 The Galley and Pump assembly under construction. A flexible water line extends through a port beneath the boat, allowing us to retract the water line at will. Graywater goes into a bladder when in port to be dumped ashore. 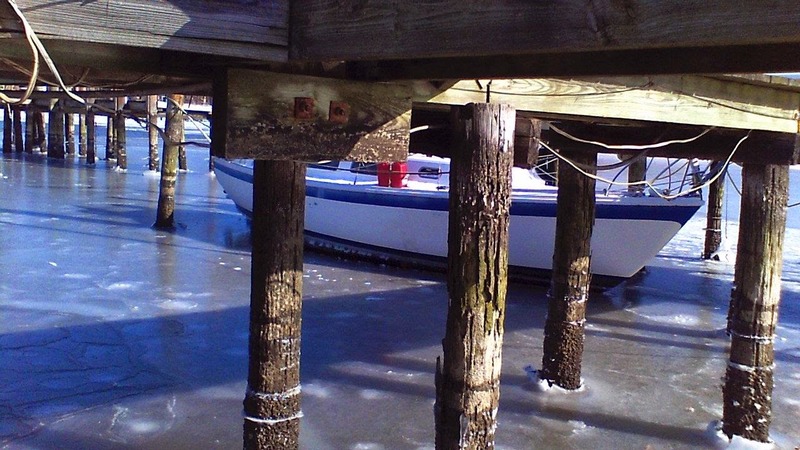 Even with the river and the marina around us frozen to a depth of four or five inches, we still never had any ice beneath the boat between our floatation. This meant that river water was always available, which is a serious plus as, in a pinch, we can filter that to potability. Our lexan windows didn't have enough play in them to account for the extreme contraction caused by the cold, and we got some cracking around the mounting screws. In future, we'll have to allow them to have a bit more play. Condensation was FAR and AWAY more of a problem than we'd anticipated. As the membrane got cold, interior humidity first condensed and then froze in a sheen along the inside, beneath the ecofoil insulation. When things warmed up, it occasionally rained. . . . .
. . . . over the bed. The first time it happened we were. . .um. . .occupied, so it was all the more startling. The addition of some DampRid containers and our small dehumidifier has really helped, but the problem does persist. We are open to suggestions. 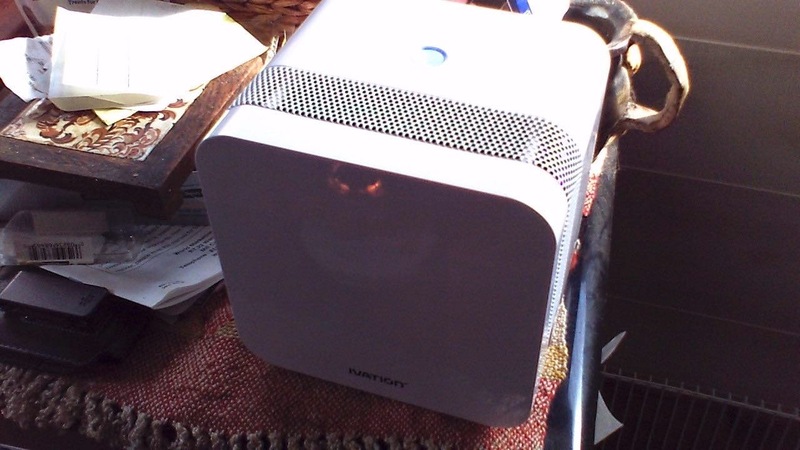 Our amazingly compact little dehumidifier has really helped, but not solved, our condensation problems. Things on a boat get messy in winter. Wet boots accumulate by the door. Nobody wants to go out in the snow to get the kero, so you wind up with a couple of small containers of it by the door as well. The trash piles up. You have heavy clothes, heaters, boots, all manner of things out and in use and in the way. Things get dirty, particularly the flooring, and things that are easy to clean or deal with in summer suddenly become awkward and cumbersome in winter. It's the same with a house on land, but in a small space on the water, it becomes amplified. I can't just set the trash outside, there's WATER out there. You get the idea. Extreme low tides, driven by north winds, literally at times extracted ALL the water from under us. I mean that literally. I could open the floor hatches and I was looking at dirt. This made getting off and on the vessel chancy at those times, and rather increased the isolation of the winter. After a busy summer, full of parties and people and friends and noise, the Winter was a welcome respite. We were often alone in the Marina, the river is beautiful, the wildlife active year round about us, and the quiet was nice. But as the winter progressed, there were increasing numbers of days where just getting OFF the boat was impractical. We contented ourselves by making amazing meals and watching downloaded films, but when our elderly Mac died, I nearly went out of my skull (Morgainne is far more self-sufficient than I). We have weathered the winter just fine, and we finish it healthy and happy, but ready for spring. I'm not sure the cat noticed at all. Hey with our computer now back online, we'll be adding more things here and to our other blogs Life, Art, Water and Onboard Cooking. Stop by and give them a look in the coming days.